I've been considering ordering a 1 watter kit but I was concerned that it wouldn't be useful in the downward sunspot cycle. 1Watter board with initial 100nf caps installed and starting inventory of other parts. Not shown are the myriad toroids (fun, fun), transistors and pots. So I spent some time this afternoon making 1 watt contacts on 20m and 40m with my Elecraft KX3 just to see what staying limited to that power would be like. I've made casual 1w contacts in the past but staying at 1watt was a good test for me. It turned out that I had a plenty of answers to my 1 watt CQ calls and received reports that were only one or two points down from my report to the calling stations. The last station I worked dropped down to 300 milliwatts and I still copied him fine. So I ordered a 1 watter kit for 40m from Kits and Parts today. The 1 watter kit is significantly more involved to build than the Elecraft kits I've assembled to date. 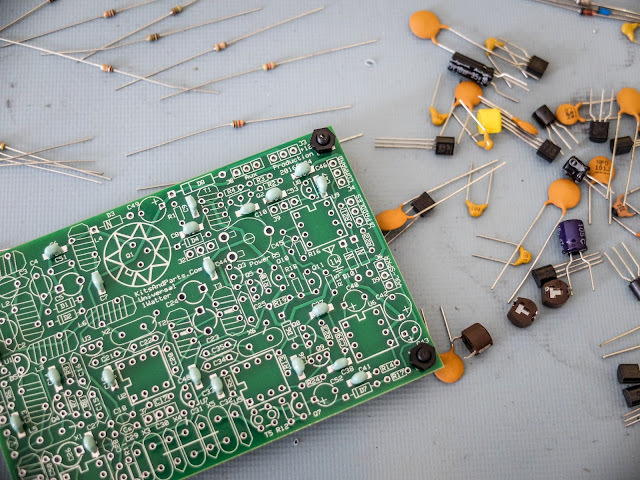 I hope to learn a lot from the build and alignment and I just might finally have a reason to buy an oscilloscope (hopefully my wife doesn't read this). I received the kit yesterday. 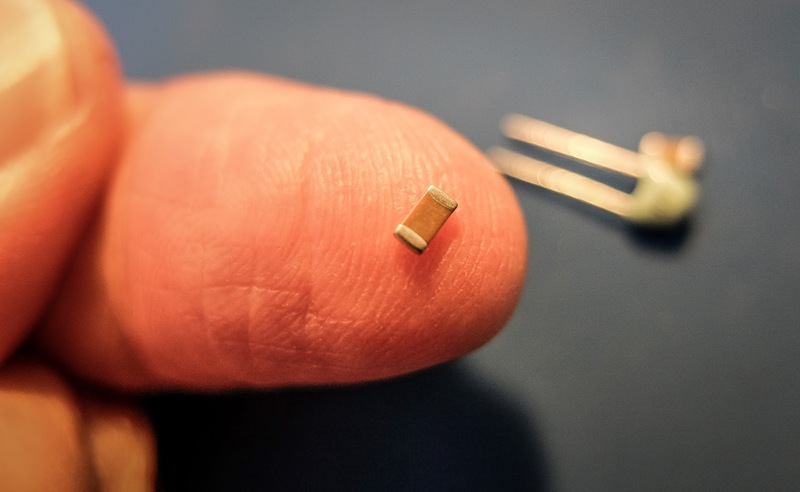 It includes 21 100nf SMT capacitors that the builder "highly recommends using". 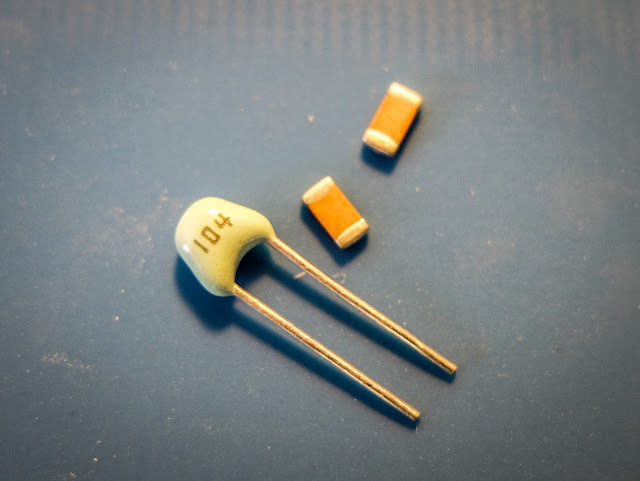 Optionally he supplies through-hole capacitors. I tried figuring out hold to hold the SMT part in place to solder for about 30 minutes and gave up. I don't have 3 hands. 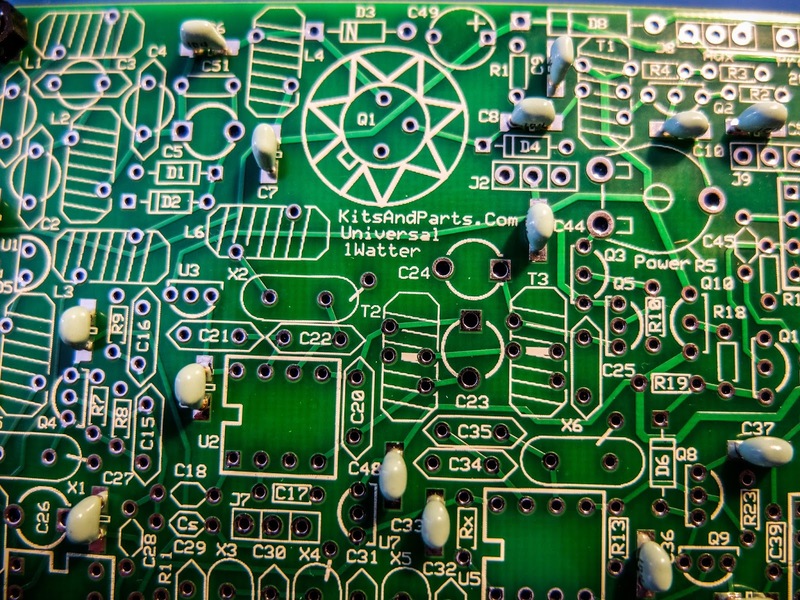 I'd have to have someone show me how to solder an SMT part. Even in the linked video to building the kit the builder used the through hole components so I don't know why the SMTs were supplied or were highly recommended. So I used the through hole capacitors. I haven't built enough kits to have spares like this so I sent them a note and will see how long it takes to get the resistors. I haven't inventoried the rest of the parts yet but so far I'm a bit disappointed. I have built 4 kits from Elecraft and one from 4-State QRP and all of those kits had all the parts. Although in the case of 4-State QRP one of the plastic knobs was broken in shipment. They sent me another in 3 days. 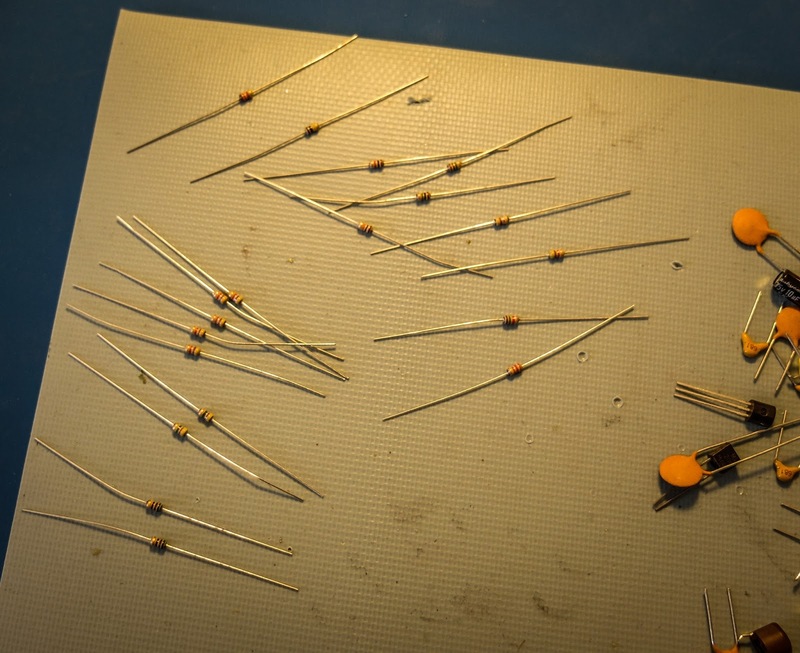 Soldering SMT caps (and resistors) that size isn't so hard. First melt a small bit of solder onto one of the two pads. Then pick up the part with tweezers and put it in place while remelting the solder you already have on the pad. You'll need a VERY fine tip on your iron and not more than 20-40W of power (QRP SOLDERING!) on the iron. Hold the part in place while the solder cools. Now heat the other side of the part while applying solder. 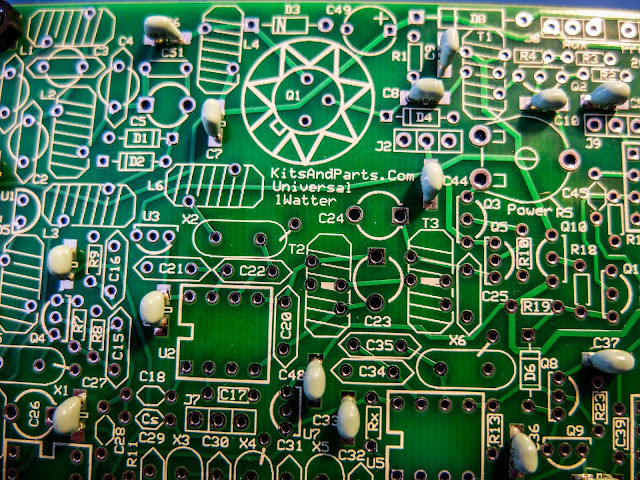 Once that side is done, apply a bit more solder to the first side, which probably was only JUST soldered in place. I've done parts as small as 0600 this way. Thanks Ken. I believe that Santa may deliver another 1Watter for Christmas and this time I'm going to take a shot at using the SMT capacitors based on your soldering instructions. 1watter was my first experience with surface mount. I used a solder rosin flux pen to lay down some flux, then dropped the smd down onto the gooey flux, soldered one side while holding smd down with a toothpick, and then soldered the other side. Was easier than I thought it would be. I have no doubt, there are a bunch of techniques to get the job done.